One of the main reasons for poor posture is a closed heart. If we are afraid, lack self-confidence and self-esteem, or suffer from any of the other manifestations of a closed heart chakra, we try to protect ourselves by physically bending in at the heart center and solar plexus. Much of our deep emotional pain in stored in the solar plexus (between the navel center and the breasts.) Our protective instincts are often initiated in the area of the solar plexus. To open the heart, we must begin at the solar plexus and cultivate a deep non-verbal relationship with the emotional energies residing in that area of our body. Fear, anger and sadness are the lions that guard the gate to the heart. We must befriend them to open our hearts. Muscularly the heart needs the support of the back muscles to stay open. If our back muscles are weak, we gradually collapse and bend over. Ideally, we operate from our heart. When we walk, our heart should lead. The problem is that we have become talking and walking heads. Our body ends up being a source of transportation for our thoughts about what we think we should be doing. What happens is that our physical head actually leads when we walk and protrudes over our body even when we are eating, talking or sitting working at our computer. When our head is not evenly balanced over our spine, our posture gets out of alignment. Our body has to compensate for the weight of the head sticking out in front of the body. Because we live in our thoughts and not in the sensations in our bodies, our energies stay in our upper body, from the shoulders up. When we are energetically top heavy, many things get out of alignment, including our posture. If our shoulders can't relax, our heart center is not relaxed. Our navel center is the third eye of our physical body. It is also the physical mid point of the body. When it is weak, we literally have no physical center or way to direct our lower centers. Our physical movements should be initiated from our navel center. However, when it is weak or off center, by default we initiate from our head. Inhale before initiating movements. Usually we move and then realize we are holding our breath. Checking periodically to make sure our head in comfortably over the shoulders and not forward. We can pull it back slightly. Lie on the floor with pillows or folded blankets under the spine at the level of the heart and solar plexus. While holding a strap that is at least 3 feet long in the two hands, move in various directions to loosen up the front and back of your body. Learn how to move and strengthen the muscles in the mid back. You can make up a lot of movements, which will feel good and move the energy. Move shoulders, hands, arms, fingers and spine back. We are often stationary. Inaction creates stagnation of energy. Stand up and shake your limbs. Do shoulder shrugs and neck rolls while you are sitting. Be creative, but stretch and move! Our daily practice of Kundalini Yoga should include exercises to cultivate energy in our lower chakras, strengthen the navel point and open the heart center. Shoulder shrugs and neck rolls provide a lot of relief if practiced on a daily basis. Exercises to strengthen the back muscles and open the shoulder blades include exercises like cobra, bow and camel poses. Here is a short Kundalini Yoga set that works on opening the heart center. It is taken from my book Relax and Renew page 102 and was taught by Yogi Bhajan in 1973. (1) Clasp fingers in Venus Lock, but curl Mercury (little) and Sun (ring) fingers into the palms instead of crossing them. Then hook left Saturn (middle) finger over right Sun (ring) finger and pull, hard. Focus at the 3rd Eye, continuously pulling hard on the finger lock for 1-3 minutes. Removes anger and enthrones the neutral mind. Keep the breath in the solar plexus and feel the energy and sensations there. (2) Fit base of palms under the cheek bones and push as hard as you can for 1-3 minutes. It doesn't have to hurt, but if it does, you have the right spot. It actually takes stress out of the head and gives you a glowing complexion. You are so happy when it is over! (3) Grasp left wrist with the right hand and pull the left arm as far to the right as possible, and then some more!, for 1-3 minutes. 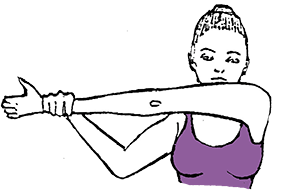 Removes tension across shoulder blades. This exercise opens up the back and heart and connects the energy of the arms and hands with the heart. 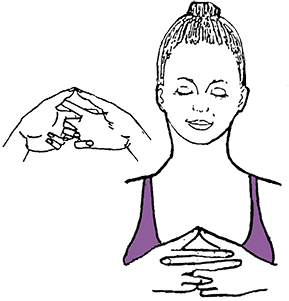 This and exercise_(4) are good exercises for symptoms of carpal tunnel and numbing of the arms and hands. These conditions are partly caused by blocked energy between the hands, arms and heart. (4) Make wrist lock behind the back with the hands touching the spine and try to bring elbows together. Pull! Arch the spine forward and apply chin lock for 1-3 minutes. Raises energy up the spine and elevates you! This is a fabulous exercise to do many times a day. You can open your heart from the back. Feel your shoulder blades move down and together. A lot of stress, which is blocked heart-center energy, will be released. Enjoy! This short set leaves you feeling great! Perfect for depression, anger, fatigue or stress.